For folks in technology and digital marketing, it’s almost accepted wisdom that the smart devices like Homepod or Google Home are going to drive major change in how everyone (i.e. the mass market) will experience media, entertainment and get things done at home, in transit and at work. It’s always been a matter of how fast and in what ways. 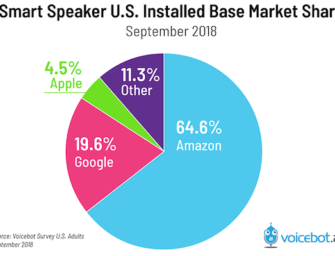 It’s time to take the “smart speaker” and voice recognition/AI space seriously, to start understanding the fundamentals of the market and how it’s going to shape business and brand building options in the next couple years beyond the speaker, at the voice platform level. So, strategists have to dig in and start building their own predictions and points of view. And not in a “Sure-i-know-how-Alexa-works” way, but in a “I-can-see-how-this-playing-field-will-evolve” kind of way because it will drive real opportunities for brands and companies who are betting on customer experience as their differentiator. The market is growing faster than you think. While it may seem like it’s been around forever, the first Amazon Echo device was sold just four years ago. Google’s Assistant was announced early 2016, and Google Home was launched in November 2017. Since November of 2014, the Alexa ecosystem has exploded and Amazon owns the smart speaker category. Adobe estimates that almost half of US homes will have a smartspeaker by the end of 2018. But, In some ways the space, especially “voice only” applications, feels like “the internet” circa 1996: Everyone knew it was going to be the next era in computing, but everyone was trying to figure out what it was going to look like, how to do it, which tools to use, and what does “good/better/best” design look like. The technology required to deliver your weather report, on demand, from a speaker across the room is mindbendingly complex and fascinating. But, we have faith in the talent and ingenuity of the wizards at work in the labs at HQ as they push tech forward to make our lives a little easier or more interesting. What we really need to watch is the policy and strategy choices at the platform level. So, we should be watching the platforms emerge at Google and Amazon, scratch our heads about Apple & Microsoft, wonder what’s really going on at Salesforce, IBM, and Samsung, and hope in vain for a viable, open source alternative to the commercial players. Amazon Just Pulled An Apple - This is a really good take on Amazon’s recent announcements at their fall hardware event and she argues that Amazon’s dual focus on improving the developer experience AND the user experience is going to give them the same platform advantage that Apple enjoys on the phone. When you see all the announcements AMZN has just made, you wonder what the folks at Apple have been up to. Alexa: Amazon’s OS - The always insightful Ben Thompson saw a couple years ago where Amazon was going with Alexa, making a super compelling argument that Alexa is the OS for the “voice interface” generation of computing. The Fire phone was a failed feint, the speakers are the tip of the spear; the real action is the combination of AWS and Alexa. SoundHound Gets $100MM - It’s worth noting that there are viable competitors beyond AMZN, GOOG, MSFT, AAPL. The list of strategic investors behind SoundHound suggests the desire by corporate customers to a) not cede the market to AMZN et al and b) Have a front row seat while the market develops. Those investors include Daimler, Hyundai, Tencent, Midea and Orange. Previous investors also participated in the round including Samsung Catalyst, NVIDIA, KT Corporation, HTC, LINE, and Nomura. VoiceBot - This site has become a daily read for me. Blends voice interfaces with a strong focus on AI. Nielsen / Normal Group Analysis on the Future of Interaction - I appreciate the emerging classification approach here (e.g. Voice first, voice only, screen first) and the guidance on what to look for/what to avoid. After reading this article, I feel like I’m better able to critically evaluate the voice+screen interactions I’m having. Any links we should include here? Drop us a note at hello@hellofahren.com. Related: We think it’s important for leaders to help others make connections that generate insights. So, Fahren is hosting a “Voice as Interface” event on 10/3/18 for product leaders, UX leaders and digital strategists. Come join us!